Waseda Jitsugyo’s Kotaro Kiyomiya hits a 2-run double in the 3rd inning against Nichidai Daisan on Friday in Tokyo. The Yomiuri Shimbun July 29, 2015　The world of high school baseball has been waiting with bated breath for a new star, with the prestigious National High School Championship marking its 100th anniversary this summer. The wait might finally be over as the perfect candidate has emerged at Waseda Jitsugyo, a high school that has produced stars such as legend Sadaharu Oh. Kotaro Kiyomiya is still a first-year student there, but he was the driving force behind Waseda’s victory in the western Tokyo tournament that secured the team a ticket to venerable Koshien Stadium. He batted .500 and had 10 RBIs in six games during the regional tournament. Kiyomiya came through in a key semifinal matchup against Nichidai Daisan, winner of the national championship in 2011. The teenager stepped into the batter’s box in the third inning of a scoreless deadlock with two outs and runners on first and second. He worked the count full after the lead runner stole third. The pitcher fired a fastball but Kiyomiya sharply hit the pitch, smacking a sharp line drive off the right-center field fence, plating two with a double. Waseda Jitsugyo protected its lead in the remaining innings for a 2-0 victory. “The ball came to me just right, so all I had to do was hit it,” Kiyomiya said. He also played a big role in Sunday’s final against Tokai University Sugao. 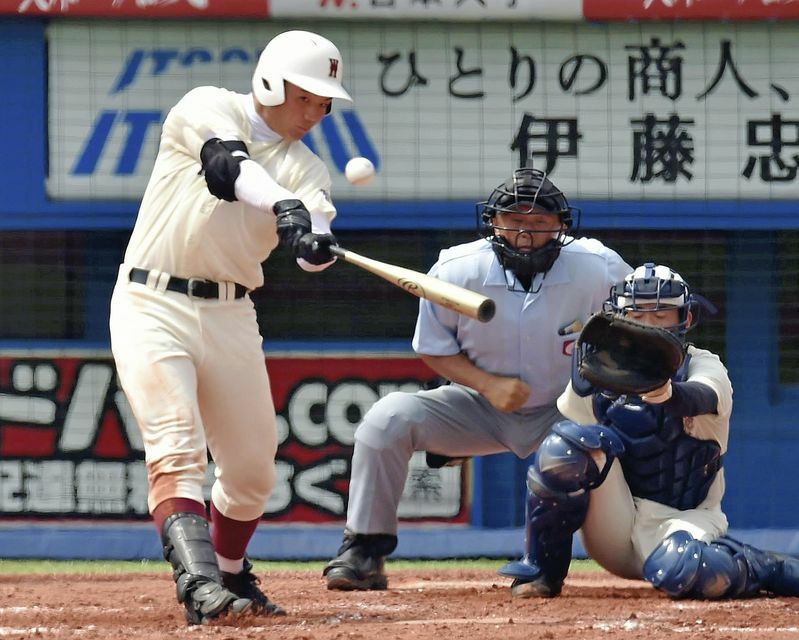 He had an RBI single in the eighth inning during Waseda’s eight-run explosion, and the team won 8-6. Tears welled up in Kiyomiya’s eyes as he watched his older teammates cry. “I wasn’t expecting that — I was determined not to cry whether we win or not,” he said. Athleticism runs in Kiyomiya’s veins. His father, Katsuyuki, is the coach of rugby powerhouse Yamaha Jubilo and guided the team to its first Japan Championship title in February. Katsuyuki himself was a renowned forward who played at Waseda University and later with Suntory in the corporate ranks. As the eldest son of Katsuyuki, Kiyomiya has received special training since he was a young child. When he was in first grade in middle school, he was part of the Tokyo Kitasuna team that played in the Little League Baseball World Series in Pennsylvania. The local media dubbed him the “Japanese Babe Ruth” after he hit a big homer to help the team win a game there. His build makes him an ideal figure for baseball, too — by the time he started high school, he already stood 1.84 meters and weighed 97 kilograms. Kiyomiya’s determination to devote himself to the sport comes not from his physical build, talent or even the environment created by his father. His inspiration to work to be the best came when he was just a first grader in primary school. “I clearly remember how [Yuki] Saito pitched,” said Kiyomiya, who once visited Koshien Stadium to watch the summer national tournament final. That’s when Waseda Jitsugyo graduate Saito pitched against Komadai Tomakomai High School in a showdown against current New York Yankees hurler Masahiro Tanaka. Kiyomiya will now enter Koshien as a player for Waseda Jitsugyo, one of the 10 schools that appeared in the inaugural national championship in 1915.